My brother - Trond Richard - was born in 1973. Myself I was born in 1970, so I don't remember (or know) first hand so much about his first years, but my parents has told me about some of what happened back then. He actually was never diagnosed with PMD while alive. I guess the expertise wasn't as good as it is today, and especially not here in Norway, where there are only a very few cases of PMD as far as I've been told. I strongly believe that there are others with PMD who also lack the proper diagnosis... Recently I was on the phone a Norwegian PMD-boy's father for the very first time. Very interesting and hopefully someone I will be staying in touch with. I found this family just by accident, in a an article about rare diseases and handicaps. I don't know any other families with PMD kids, but this father mentioned that he had heard about one family with two PMD boys, who for some reason doesn't want any contact with other PMD families. And he had a very special girlfriend at school (not handicapped). He had always had a way of communicating, even though he only could pronounce a very few words, like mum, dad, yes, no, hi, Na-na (for Nina, he couldn't really pronounce my name, had trouble with some sounds) - and a few more. And always very bright and happy! Not to mention that he was far less mentally retarded than what many believed at first sight. After my mother took him to a new school when he was 13 his communication skills improved a lot. Especially through use of simplified sign language and a computer with pictograms and a limited speech vocabulary. The simple computer games they started with even helped him focus quicker, enabeling him to watch cartoons and football games on TV. A tip when it comes to sign language. My brother lived at home almost all his life, except the last 6 months of his life. He then moved to a so-called "group home" for handicapped young people. This home had a fantastic staff, who did everything with such warmth and understanding! Actually, he _wanted_ to move out of my parents house and have his own place! He had his own bedroom and bathroom, while sharing living room, kitchen and misc. other rooms in a nice house in a villa area, not too far away from my parents house. He even picked out his own new curtains himself, with colors and patterns very much against my mother's taste! Not my taste either... Not at all ugly, but definitely his own style - and with so strong determination! A very nice memory for me! A lot more could be told, but I guess I should try to keep it not too long... (or that's maybe too late now...) Anyway, my brother sadly passed away in May 1992, at the age of 19. My parents asked for an autopsy, to maybe find out what had caused his condition, since there never had been any diagnosis. We got an answer back, saying nothing really, other than heart and respiratory failure. Nothing else was communicated to us, and we settled with this, believing that nothing had been found. But then, 5 years later, my mother by accident met one of the attending doctors from the hospital where he died, and they started talking. A long story short, the fact was that there HAD been a precise autopsy result, but this had been filed without any copy or other information to us! The answer - as you understand - was Pelizaeus Merzbacher Disease (PMD), but no known mutation in his case. And therefore carrier detection of my mother and myself was not possible, or at least so we were told. 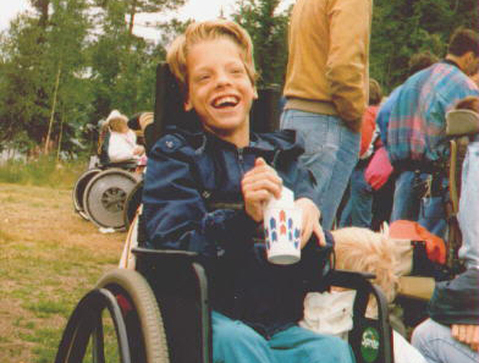 There are no other known cases of PMD in my family, and no other PMD-like handicaps either. My mother had two sisters, who got 1 and 2 healthy boys respectively. My parents had two kids, my brother and myself. I was finally able to test myself regarding being a carrier or not a few years back, even with no known mutation in our family, and the test showed that I'm a carrier. During pregnancy I had an CVS test done, and to our luck, we were expecting a healthy baby boy! And time flies, he will be two years in the end of May this year (2009). He is a blessing, healthy, happy and almost as talkative as his mother!